On 25 September, the Gaidar Readings: “The New Rules and Mechanisms of Development of Russia’s Far East: Effective Practices of States of the Asia-Pacific Region and the Historic Background of the Economy of the Region” took place in Vladivostok. 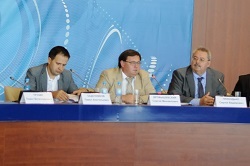 The sponsors of the readings were the Gaidar Institute, the Yegor Gaidar Fund and the Far Eastern Federal University. The welcome address was delivered by Viktor Atamanyuk, Provost for the Economics and Finance of the Far Eastern Federal University. The moderator of the morning session was Sergei Prikhodko, Executive Director of the Gaidar Institute. Within the frameworks of the first session, Nikolai Dubinin, Deputy Director of the Department of Territories of Advanced Development and Infrastructure of the Ministry for Development of Russian Far East took the floor. In his report: “Do Negotiations in the Asia-Pacific Region Form New Global Trade Rules”, Pavel Kadochnikov, Provost for Research at the All-Russian Academy of Foreign Trade of the Ministry of Economic Development of the Russian Federation spoke about the architecture of integration agreements in the Asia-Pasific Region, modern trends of regional trade agreements, as well as contribution of mega-blocks into the regional economic development. 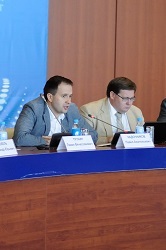 In his report: “The Prospects of Integration of Russia with States of the Asia-Pacific Region and Its Effect on the Far Eastern Region”, Alexander Knobel, Head of the Foreign Trade Department of the Gaidar Institute drew a conclusion that in the long-term prospect free trade zones with Asian states would be advantageous both in terms of the aggregate public welfare and production of individual industries, except for, probably, the textile industry and other manufacturing industries in entering into agreements with the ASEAN in general and Vietnam, in particular. As regards the textile industry, exemptions should probably be used. It is to be noted that as regards the Far Eastern Federal District the effect will be greater than for Russia in general. 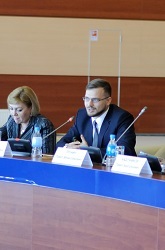 Pavel Trunin, Leading Researcher of the RANEPA’s Center for Research of Central Banks’ Policies delivered a report “The Potential of the Coordinated Macro-Economic Development of the States of Asia-Pacific Region within the Frameworks of G20 and BRICS”. Pavel Trunin reminded that the growth strategy of the Russian economy approved by G20 states on 5 November 2014 was aimed at achieving growth rates of Russian GDP at the level of 3%-4% in the mid-term prospect. Achievement of the set goal suggests stimulation of private and state investments, as well as upgrading of the situation on the labor market, maintenance of the macroeconomic stability with a low and steady inflation, flexibility of the formation of the exchange rate regime and pursuit of responsible budget and debt policy. 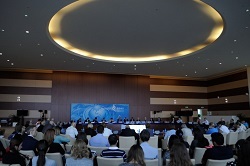 An important prerequisite of growth is structural reforms which ensure conditions for attraction of highly efficient, skilled labor and higher labor efficiency, buildup of investments, including those in infrastructure by means of development of special economic zones, development of the private-public partnership, upgrading of the efficiency of state investments and the quality of budget administration, development of the system of state guarantees and promotion of availability of credit resources for the small and mid-sized business. Also, structural reforms are to ensure macroeconomic stability and increase the shares of high-tech and knowledge-intensive production in GDP, improve the investment climate, including by means of modernization of tax and antitrust legislations. Viktor Belkin, Doctor of Economics, Advisor to the Director of the School of Economics and Management of the Far Eastern Federal University spoke about the experience of the Shenzhen free economic zone. Irina Boiko, Doctor of Economics, Professor of the Department of the Global Economy and International Relations of the Institute of International Business and Law of the St. Petersburg State Research University of Information Technologies, Mechanics and Optics delivered the report: “The Russian Regional Economic Policy: A New Form in Conditions of the Changing World”. Sergei Drobyshevsky, Director of Research of the Gaidar Institute delivered the report: “The Challenges of the Economic Policy of Russia in a Situation of Growing Turbulence of the Global Economy”. Within the frameworks of the Gaidar Readings at the Far Eastern Federal University, opening of the Yegor Gaidar Lecture Hall took place. The moderator of the afternoon session of the Giadar Readings was Yelena Gafforova, Doctor of Economics, Professor and Director of the School of Economics and Management of the Far Eastern Federal University. At the second session, the speakers were as follows: Alexander Palchikov, General Director of the Ava-Trade Company (the Report: “The Industrial Parks: Concepts and Roles in Sustained Development of the Region”), Аlexander Abramov, Director of the Far Eastern Center for Economic Development and Integration in the Asia-Pacific Region (the Report: “The Social and Economic Development of the Far East: New Challenges, Business-Models and Adequate Mechanisms”) and Таgir Khuziyatov, PhD (Economics), Professor of the Department of the Global Economy of the Far Eastern Federal University (the Report: “The Foreign Experience in Making Procedures Simpler for the Benefit of Development of Trade”. 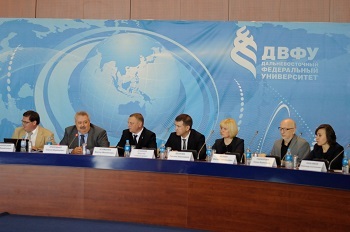 Also, within the frameworks of the second session reports were delivered by Grigory Tomchin, President of the Fund for Support of Legislative Initiatives (the Report: “The Required Legal Regulation for Establishment, Development and Functioning of a Free Port in the Far Eastern Region”), Sergei Yachin, Doctor of Finance, Professor of the School of the Humanities of the Far Eastern Federal University (the Report: “HR Management in a Situation of Cooperation of Russia’s Far East with Countries of the Asia-Pacific Region) and Yelena Gafforova (the Report: “The Innovation Eco-System and Entrepreneurship: Mechanisms of Impact on the Region’s Social and Economic Development”). Also, within the frameworks of the Gaidar Readings lectures were delivered by Sergei Drobyshevsky, Director of Research of the Gaidar Institute and Grigory Tomchin, President of the Fund for Support of Legislative Initiatives.